Former Bulgaria forward Hristo Stoichkov has warned Barcelona's Pedro not to join Manchester United, calling their boss Louis van Gaal "mediocre" and someone who "destroys" clubs. United are reportedly keen for Pedro to replace Angel Di Maria, who joined Paris St-Germain for £44.3m last week. Stoichkov, 49, who played under Van Gaal at Barcelona, said: "I'd never be under the orders of this Dutchman. "If he goes there he would no longer be a footballer." Van Gaal was in charge at Barcelona from 1997 to 2000, winning two La Liga titles, the Copa del Rey and the Uefa Super Cup. But 1994 Ballon d'Or winner Stoichkov, who made 336 appearances for Barca in two spells during the 1990s and scored 162 goals, said: "He is destroying all the players because he is so mediocre, players have left because of him. "He destroys clubs, he did it with Barcelona, and after they take years to build," he told Spanish radio station Onda Cero. Spain forward Pedro, 28, is a product of the Barcelona youth system but has had a lack of first-team football following the arrival of Luis Suarez and Neymar, who have formed a three-man attack with Lionel Messi at the Nou Camp. 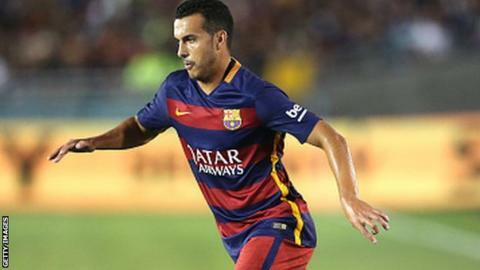 "Pedro is a symbol of Barcelona, a type of player with energy, he fights to make himself great. Why do Barcelona need to sell him?" Stoichkov said. Stoichkov, who branded Van Gaal "scum" in an interview in March, was unimpressed with United's 1-0 win over Tottenham in the opening match of the Premier League season on Saturday. "He has spent £200m and the other day I saw his first game of the season. Disastrous. He won 1-0 because of an own goal."